An electric hand mixer makes quick work of mixing a cake, cookies or other dishes. 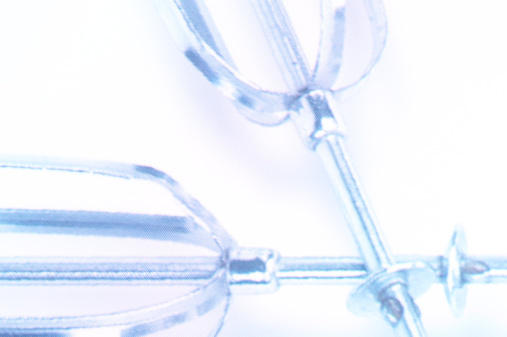 Proper maintenance of a hand mixer requires cleaning both the mixers and the case to remove stuck-on food. You must clean both the mixer and the attachments. Wipe the outside of the hand mixer with a damp cloth that has been dipped in cool water. For harder stains, lightly scrub the outside of the mixer with a dry cloth. Remove any blades, mixers or other attachments from the mixer and wash those separately with dish soap and water. You can also clean the attachments in the dishwasher. Be careful when using water around the hand mixer and never get water inside the case. This can cause the hand mixer to stop working. Squeeze the excess water from the cloth before wiping the case. Unplug the hand mixer from the wall before cleaning. If you leave it plugged in and turned on, you risk electrocuting yourself or causing serious damage to the motor of the mixer.